My daughter received a birthday party invitation with this layout so of course I had to try it. 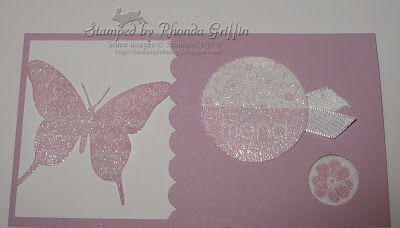 This uses the True Friend Stamp Set and Dazzling Diamond Dust technique....Simple and sweet....Pretty sure I'm going to use this layout again too. This is what my girls made tonight at my first downline meeting. It makes an impressive card, but is suprisingly easy. I used the Oval All set for the dot border, Very Versatile thank you, and butterfly from Great Friend all with white and Regal Rose. 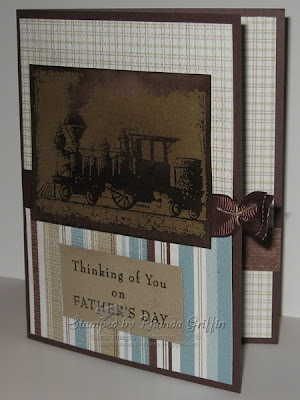 This card uses texture plates and the spotlighting technique for an interesting masculine design. This is the latest addition to my June technique class. Consider joining us on the 4th of June! 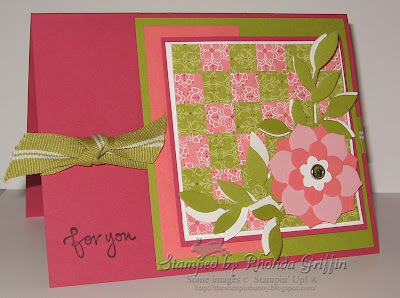 This card is for today's Technique Challenge on Stampin' Addicts. I decided to go with Rock N Roll and the Petal Pizzazz flowers and leaves. The flower is ink in Blush Blossom and then edge-rolled in Rose Red. 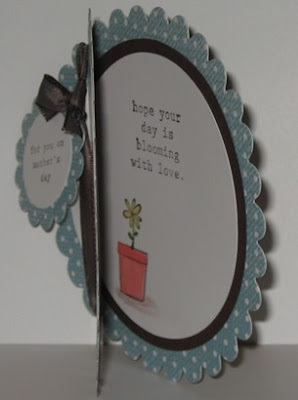 I popped the flowers up on dimensionals (after adding the Pretties Kit Half Back Pearls to the centers) to allow the chocolate chip sentiment layer to tuck under them to close the card. Cut a 5-1/2 X 12 inch piece of cardstock. Score vertically at 2, 4, 8 and 10. Cut horizontally 1-1/2 inches from the top and bottom edge from the 2 inch score line to the 10 inche score line. The top and bottom rows should be folded Peak, Valley, Peak, Valley. The middle row is creased Valley, Peak, Valley, Peak (Don't use the bone folder on this one as each fold isn't used). 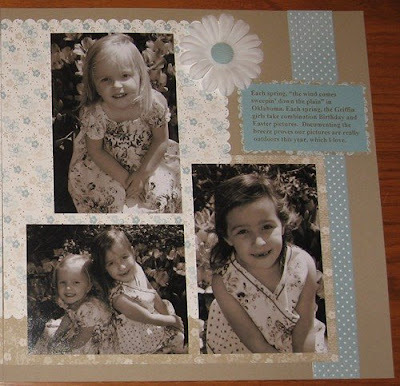 The middle row is covered by the 2-1/4 X 3-1/4 inch image mats (shown in polka dot on my example). 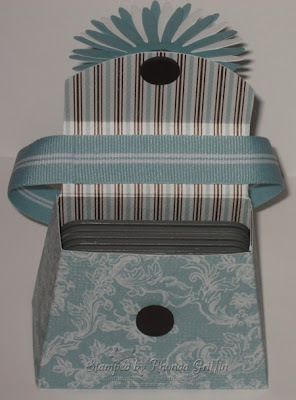 I changed the height of the card also....My card is only 5-1/2 inches high, so that it will fit in a medium SU! envelope. That makes the center portion only 2-1/2 inches high rather than 3 inches, but it was still easy enough to use this way. 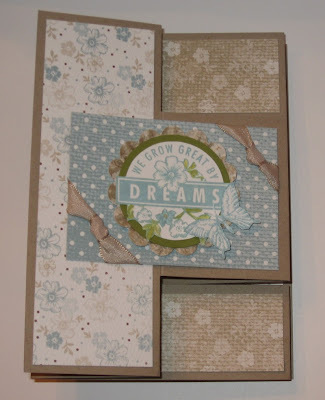 I used the Parisian Breeze Designer Series Paper and the coordinating Dreams du Jour stamp set. I also used JanTInk's ruffled scalloped edge around the 1-3/4 inch circle punch Old Olive mat layer. Butterflies, Kraft Taffeta ribbon and a flower and half back pearl from the pretties kit add interest, hopefully without competing with the lovely paper patterns. 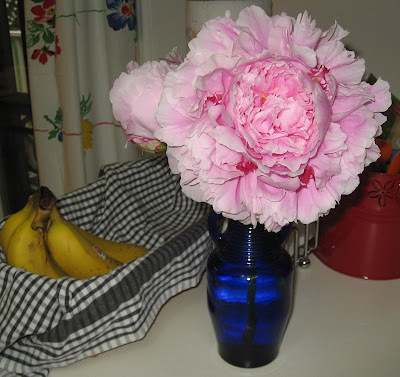 Just for fun.....I had to cut this peony from my garden because the stem fell over...I had to share even with the bananas in the background LOL. 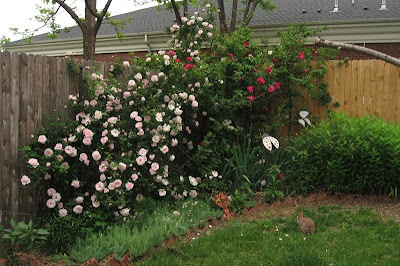 Can you find the bunny in this picture of my climbing roses? The hot pink one is about finished blooming, and the light pink 'New Dawn' is just getting started. I was inspired to try the basketweave technique because it was highlighted in our Stampin' Up! demonstrator magazine...I even used the same Raspberry Tart Designer Series Paper because I have plenty of it. Finished off with some Die Cuts from the Big Shot (Little Leaves and Birds and Blooms) makes it a little more detailed while allowing the basketweave to shine. I also used SCS sketch challenge 228 (SC228). Sorry you missed the blog tour! Throughout the month of May, buy three packs of Designer Series paper (including our Specialty Designer Series paper) or 12" x 12" textured card stock and get one FREE! 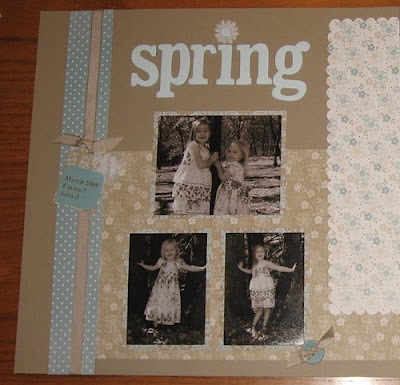 First is the Scrapbook layout I made using the Parisian Breeze Specialty Designer Series Paper. 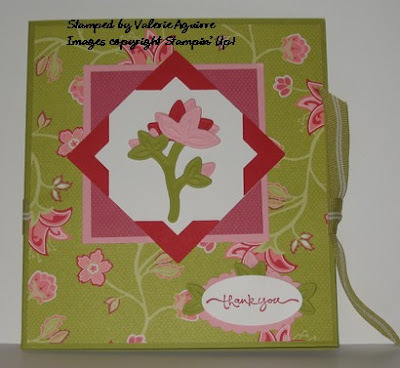 The lovely matching Baja Breeze Corduroy Buttons and Flower from the Pretties kit make it easy for even a novice like me to make a pretty page! The letters were colored with White Craft ink mixed with Baja Breeze Classic ink…I ended up with a lighter color, but I liked that. 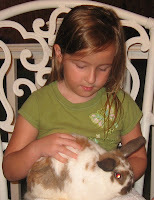 Photography by Kathryn Varner, Edmond, Oklahoma. 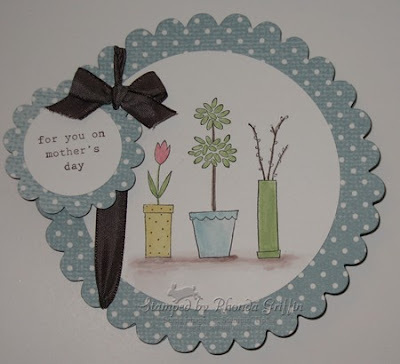 This Scallop edged Mother's Day Card was fun to make. 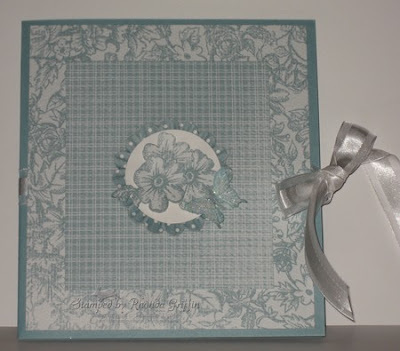 It was also the first time I used the Circle Scissor cutting system from Stampin' Up! This is a month by month card organizer you've probably seen many times, but since these are my favorite colors I had to include it! 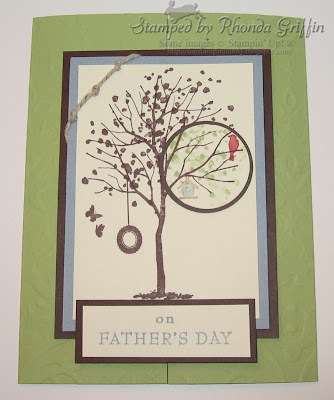 Here is a Father's Day card in which I used the Emboss Resist Technique. 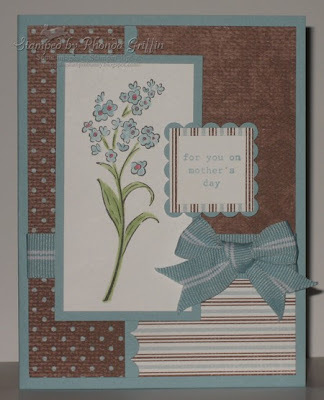 I used the scalloped and crimped edging technique created by JanTInk-Thanks for sharing!! 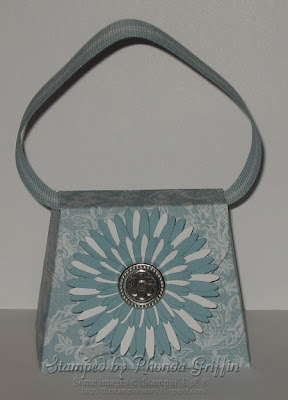 Next is a purse made with the Once Upon a Time Purse Template available to demonstrators on the Stampin' Up! website. Guess what fits perfectly inside? Ten Embosslits or Sizzlits dies! 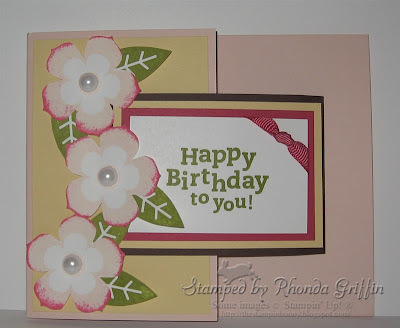 I made this card using the Mojo Monday sketch Mojo85. For more information about the tour, visit Stampin' Addicts. BOLO (Be On the Look Out) for the Parade of Paper! 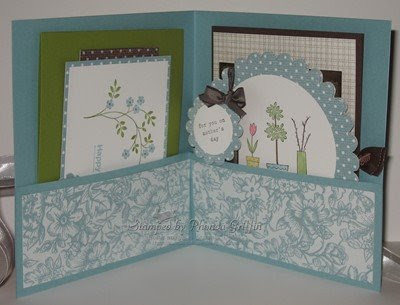 Beginning next Friday at 8:00 a.m., each stop along our Parade of Papers tour will feature projects made with Stampin' Up's Designer Series Paper created by some talented Stampin' Up demonstrators. You may start at any post, stop and pick it back up later, or visit all of them in succession. You will eventually wind up back at the blog where you started. Remember though, just like Cinderella at the ball, the fun ends at Midnight EDT on Sunday night. The tour will be over then, and the blog links will be broken. I will be stop #2 and will feature the Parisian Breeze DSP on page 158 of your current SU!catalog. We hope you'll join in the fun by clicking the links to visit all of our blogs and that you will be inspired by all the creative projects and beautiful scrapbook pages and cards. 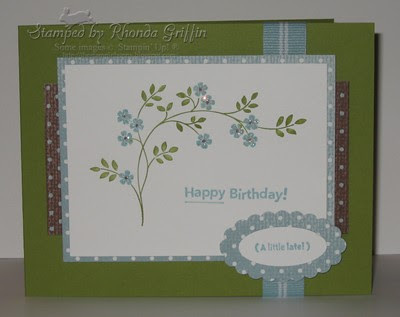 But the other part of my agenda is this: there is an awesome special at Stampin' Up! for the whole month of May! 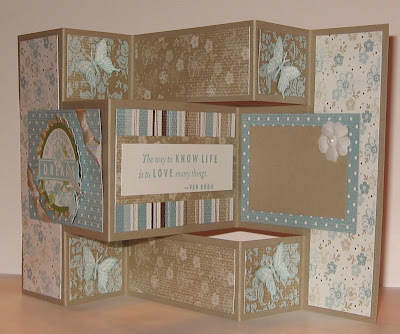 Buy 3 packs of Designer Series Paper OR Textured cardstock and get the 4th for absolutely free! How cool is that? You can click on over to my website to check it out and place an order. Speaking (or is that typing?) 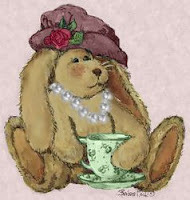 of Designer Series Paper, my downline Valerie came over on Wednesday, and we worked on some DSP projects. 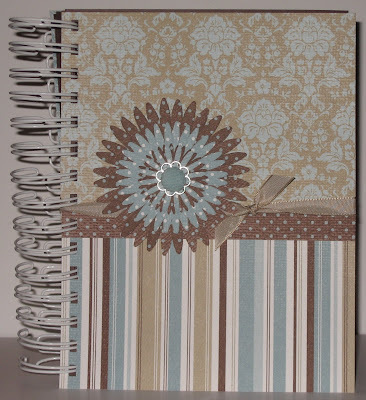 I have to share a picture of the lovely stationery folio she made.